Update 6/5/13: Sadly, it’s been reported for a couple of months now that the phone numbers are no longer working for these phone booths. As soon as we hear they’re back in order – we’ll let you know!! 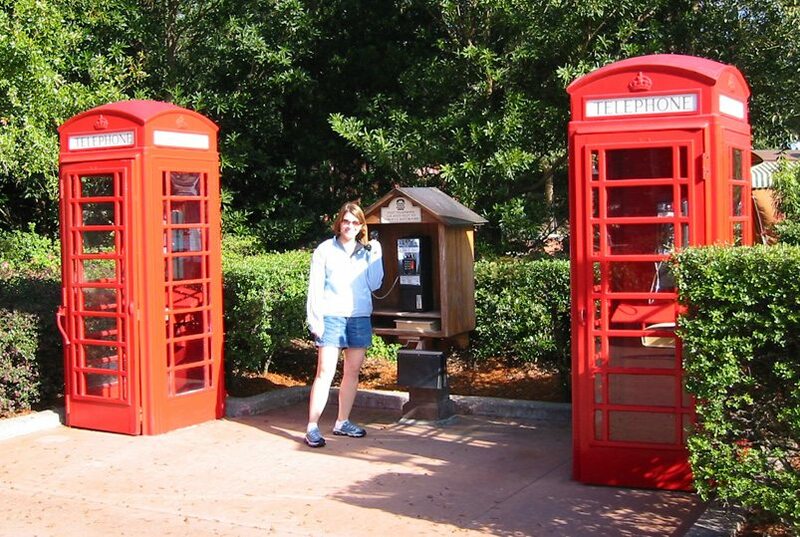 Have you ever noticed that there are three phone booths in the United Kingdom pavilion at Epcot? If you’re looking at the pavilion, they are on the right side, closer to the Canada Pavilion. They are great for photo ops, but did you know that you can call those phone booths? The next time you’re bored at work (which we’re going to assume is now, since you’re enjoying yourself on our site, instead of working) give one of them a call. People walking by are sure to be shocked when they hear one of the ring. Canada?! Yes… there’s even a single phone booth in Canada that you can call. It’s located up the stairs and to the left of the second set of stairs as you’re heading towards the Canada pavilion. I have called before and talked to people enjoying their Disney vacations. It’s a fun way to bring a little magic to their vacations and bring a bit of the Disney magic to you back home! Give it a try and see if you can chat with someone who is at Disney! Just called the 1st phone and talked to a guy who lives right down the road from Disney!! I am soooo jealous!!!!! Carol, I’ve often thought of doing this but don’t know what to say… what did you say when he answered? I did this several times while I was there last fall. Sitting on the bench in the shade at the Rose and Thorn and watching the reactions…….priceless!! It was one of THE favorite things I did this last trip!! I found If sitting there, you have to snag them right away or they hang up. I compliment something they’re wearing, then ask them where they’re from, what was their favorite ride, what resort was their favorite, food, etc. When they ask who/where I am, I tell them..”I’m the phonebooth silly”. One girl was celebrating her 21st birthday at the F&W fest, so I gave her hangover advice and also suggested she keep her ;’designated walkers’ nearby so she would be safe. The lady on the bench called a minute later so the same girl got TWO happy birthday phone calls. She walked past our bench shortly after and was giggling and SO excited that she was wished Happy Birthday TWICE by two different phone boothes! Carol, I guess that would be a good ice breaker! I’ll try it! SooooznQ, I wouldn’t have thought to do that while I was there and close by. What an excellent idea! I am driving home from Disney RIGHT NOW. I wish I would’ve found this over the weekend!! So doing this on my Spring Break trip in a couple weeks.